Medha Patkar raised several other issues like women’s reservation that has been pending for decades and said there was unanimity between other parties barring Congress and BJP to have 50 per cent reservation. Medha Patkar, social activist and founder of Narmada Bachao Andolan and National Alliance of People’s Movement (NAPM), has come down heavily on the BJP’s manifesto and made a strong case for the Election Commission to vet such documents that made unconstitutional statements. Referring to the Citizenship (Amendment) Bill and BJP’s assurance in the manifesto to implement it across the country, Patkar said it was “against the basic tenets of the Constitution”. 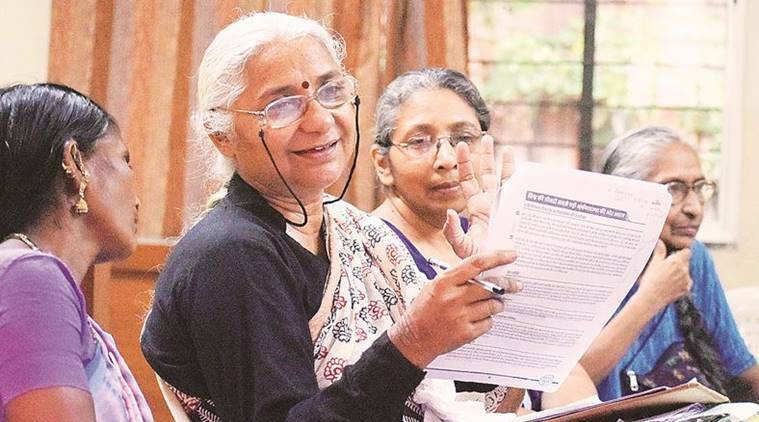 Patkar, who was in the city to address a meeting of the NAPM, told mediapersons that “hollow promises were made in the BJP’s manifesto and some statements were dangerous and unconstitutional”. In its manifesto, the BJP has committed to enact the Citizenship (Amendment) Bill, 2016 for the protection of individuals of religious minority communities from neighbouring countries escaping persecution. However, the Bill seeks to provide citizenship to illegal migrants who are Hindu, Sikh, Buddhist, Jain or Parsi. It does not have a provision for Muslim sects. “Even as Assam has erupted in protests, the BJP in its manifesto has said they will implement the Bill across the country . Unfortunately, the EC does not check such statements,” she said. It has been a long pending demand to consider manifestos seriously and Patkar, who claims to have studied at length the manifestos of BJP, Congress, Vanchit Bahujan Aghadi, CPI and CPM and other political parties, appealed to intellectuals and educated communties to compare each party’s manifesto, read between the lines and check what has happened in the past. “While both BJP and Congress have presented 50-55 page long documents, BJP has made general statements on issues while Congress has given a studied opinion on each subject. So, while BJP has made general observations on caste and communalism, the party has failed to mention anything for Dalits, Adivasis. They have only said that the SC/ST and tribal population would be entitled to their rights as granted by the Constitution. On the other hand Congress has made detailed observations about issues like mob lynching and caste related problems,” she said. On the issue of unemployment, however, there is not much of a difference between both parties. Patkar stressed that globalisation, liberalisation and privatisation have brought in corporatisation and this policy has killed employment in the country. The sources of livelihood of also natural resources based communities are being diverted in the name of privatisation, she said and this situation of joblessness has been there for decades. Deprived communities who need reservations still do not feel secure and according to both parties’ manifesto do not offer major solutions. She also lamented that the parties had not mentioned about the Swaminathan Commission that addressed the problem of farmer suicides and had recommended solutions. She, however, complimented Congress on the strategy of loan waivers for the farmers. While the BJP’s focus is on zero-tolerance approach to terrorism and the manifesto has constantly referred to security issues, Patkar raised eyebrows over Pakistan Prime Minister’s endorsement of Modi if he was re-elected as PM and hinted that these endorsements “makes one question Modi’s nationalistic credentials”. She also made a point to state that several important institutions had to deal with interference from the PM’s office be it the CBI, RBI or CAG. “In fact demonetisation occurred without the permission of RBI,” Patkar said, adding that all these institutions are being undermined. Patkar raised several other issues like women’s reservation that has been pending for decades and said there was unanimity between other parties barring Congress and BJP to have 50 per cent reservation.